The shop is most famous for its springtime specialty, asparagus tamales. LOS HERNANDEZ tamale shop is a small, unprepossessing cinder-block building on Main Street in Union Gap, Yakima County. That four-lane strip itself has had more prepossessing days: It runs to weathered purveyors of Western wear, antiques and used cars, plus a few pot shops. Owner Felipe Hernandez calls his place “modest,” but Los Hernandez’s tamales are immodestly excellent. They’re known far and wide, with the guest book on the counter containing the happy testimony of visitors from all over the United States and as far away as England, Argentina and China. Hernandez’s family comes from Piedras Negras in Coahuila, Mexico, just across the border from Eagle Pass, Texas; Los Hernandez’s Texas-style tamales are from his sister Leocacia’s recipe. The shop is most famous for its springtime specialty, asparagus tamales. Hernandez and his family were making them with Yakima Valley asparagus long before all things local and seasonal came into vogue. He started the shop 25 years ago, after he got fired from Montgomery Ward, and the asparagus tamales debuted about a dozen years after that. His daughter, Rachel Wilburn, says they’d acquired another building to keep up with demand for their chicken and pork tamales, and her mom bought asparagus at the neighboring fruit stand to take home for dinner. Then they decided to experiment with leftover masa. “Then we said, ‘You know what would be really good?’ ” Wilburn asks rhetorically. “Cheese! It was really a no-brainer.” The cheese in Los Hernandez’s renowned asparagus tamales is regular old mass-market pepperjack from Cash & Carry — the fancier cheeses they tried just didn’t melt as well or taste as good. “Everybody loves it in our family,” Wilburn says. The corn for the masa is ground and cooked from scratch, which might account for its unusual creaminess. 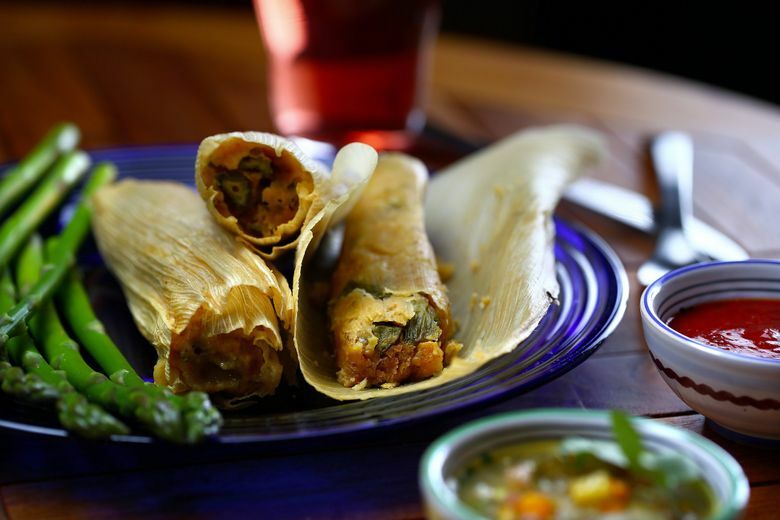 Once liberated from their corn-husk wrapping paper, the tamales are deep gold in color, with different-sized pieces of asparagus showing through; when you eat one, you hit lodes of pepperjack on the inside, providing slight, pleasant hits of spice. The masa for the asparagus version is made with shortening, so they’re vegetarian (and, naturally, gluten-free). Fans of meat might like Los Hernandez’s pork tamales even better: That masa, made with lard, is almost liquidy-soft and extra-rich, matching the tender, savory filling. You might still catch the tail end of this year’s asparagus tamales if you hurry to Union Gap; the season runs from roughly mid-April until sometime in June, depending on the weather (the shop’s Facebook page has asparagus-tamale status updates). Los Hernandez also does a limited amount of mail-order of its tamales frozen, be they asparagus, pork or chicken. “We’ve shipped to Texas, believe it or not, and New Mexico,” Felipe Hernandez says. “They don’t have tamales down there,” he says, laughing. Hernandez can’t even count how many tamales they’ve made since starting in 1990. “Oh my gosh . . .” he says. “A few years back, I said millions, so now I would probably say more millions.” During asparagus tamale season, they make 500 dozen at a time of just that kind alone, about four or five times a month, for two months. Hernandez says that sometimes people call “from the west side” — of the Cascade Mountains, that is — wanting to make reservations. Los Hernandez’s four tables have bright, cheerful tablecloths covered in plastic, and a mix of wood and plastic chairs; the menu is tamales only. They don’t take reservations. Bethany Jean Clement: bclement@seattletimes.com. On Twitter @BJeanClement. John Lok is a Times staff photographer.